IAF Recruitment LDC, MTS Recruitment Examination 2017: Indian Air Force has been released a notification to recruit the Superintendent of Store, Storekeeper MTS, Mess Staff, Cook, Safaiwala, Carpenter, Fireman, Civil Mechanical Transport Driver and various Posts. Only Indian citizen are allowed to apply for these posts. There are total 132 vacancies available in current recruitment of IAF. The candidates who are willing or interested in applying for these posts may apply through a specific format and filled an application to be reach to concerned regions 30 days from the notification issued date. Last date to reach the applications to IAF is 05-11-2017. 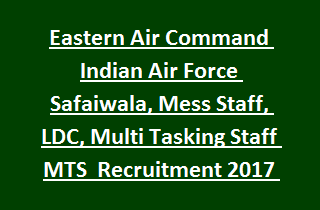 For more information regarding this Indian Air Force recruitment please see the below-mentioned details. Click here to see the official notification instructions. Applications has to reach HQ EAC IAF withing 30 days from the notification given date on employment news. The candidates who are willing to apply for this IAF Recruitment they must have qualified the 10th class (Matriculation) for all posts and having a Valid Driving License only for Civil Mechanical Transport Driver post. And Industrial training certificate in their respective trade. For LDC post the candidate must have qualified 12th class/Intermediate/HSC and must have typing skills on computer with 30 words per minute in English or 35 words per minute in Hindi. For all the other posts age limits are 18-25 years. Age relaxation for SC/ST candidates is 5 years and 3 years for OBC candidates and 10 years for PH candidates. IAF Recruitment will be held in three stages. Physical test, a common written test will be conducted and a skill test or Trade test will be conducted for the candidates who clear the written test and physical tests. Written syllabus will be Matriculation standard only. Interested candidates can apply through the prescribed application. After filling the form neatly attach the educational qualifications and other required documents and send to the respective Indian Air Force recruitment centers of Indian Air Force. For more details please see the official notification. Must have attach the self addressed envelope with Rs.5 stamps and write on application cover "Application for the Post of ________________and Category of _______".